Hello everyone, did I mention my new Tobias and Jube comic? I can’t recall. Anyway, it’s called Tobias and Jube and the Something Hat Mystery and the first chapter is up on the Stela app right now! It’ll run for five weeks; one chapter per week. It’s basically 50-something print pages, in total — a little book, like an Asterix book! It is also, would you believe, suitable for all ages. And ‘all ages’ doesn’t mean ‘children’, it means ALL AGES — I’m looking at you, Granddad! You think I can’t see you curled up on the floor behind the recliner? Granddad? Oh, the old silent treatment, eh? The old silent and motionless except for sporadic twitching treatment, is that it, old man? Pathetic. 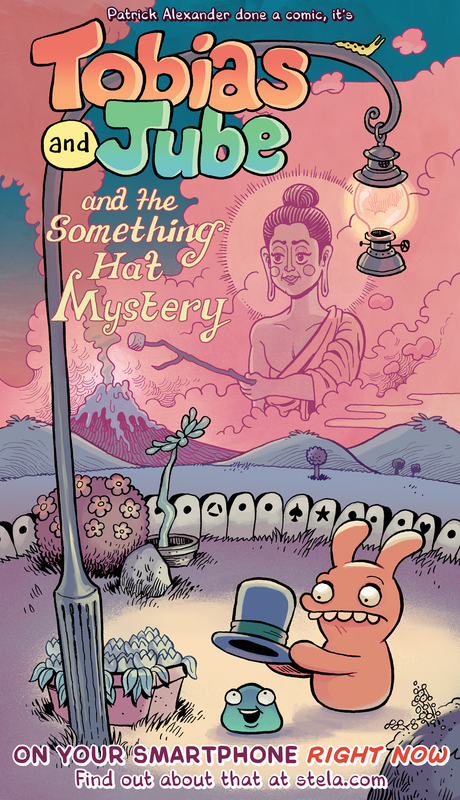 I’m exceptionally proud of Tobias and Jube and the Something Hat Mystery and excited for you all to enjoy it. It’s not free — you do have to buy it (god, I know) — but at least you can buy it without leaving your house! FRESH LAUGHTER AND NATURAL HUMAN DELIGHTS, EVERY WEEK. And phwoar, look at those gorgeous colours by Lin Visel. Pages of that good stuff. Get into it. BUT WAIT. Did you think that was all? “Oh, he’s made the funniest comic in the history of the medium, surely that’s enough for one man” — was that you just now? 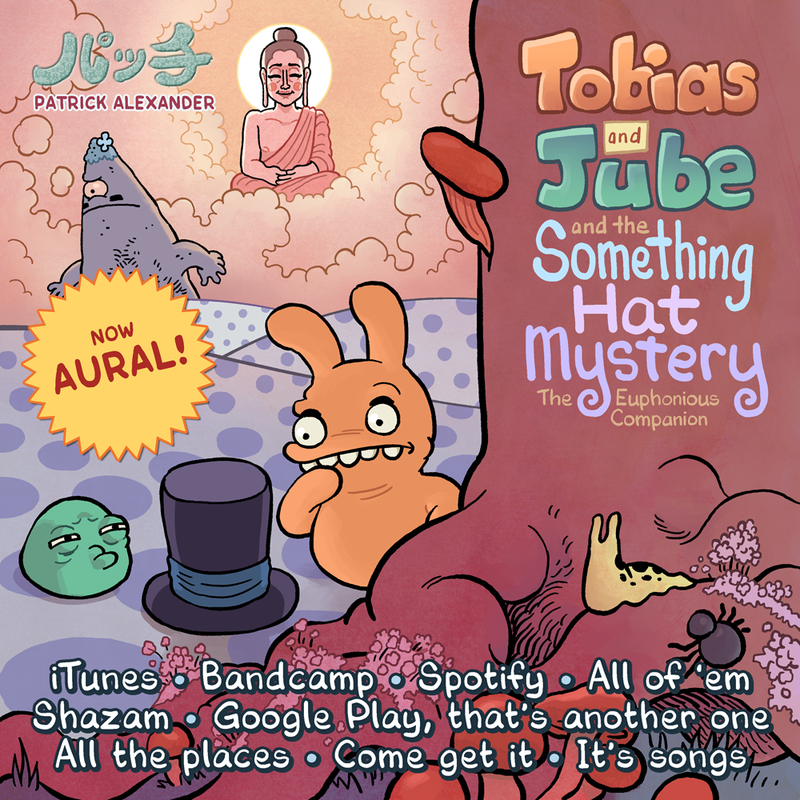 Yes, Tobias and Jube and the Something Hat Mystery is also a 30-minute album of amazing songs, subtitled The Euphonious Companion, which makes quite a long and grandiose title altogether, but I promise it’s not prog, IT’S NOT PROG. It is a POP album but WEIRD POP and oh my goodness, remember how the comic is the #1 and sole greatest thing I’ve ever done? Well the album is also the #1 and sole greatest thing I’ve ever done! How is this possible? It’s not. It’s a miracle. It is a DELIGHTFUL album; that is the word I keep using. You will be delighted. It’s only a short album — go to Bandcamp and have a listen. You will feel delight, I promise. This isn’t cartoonist music, this is cartoonist AND musician music. You’ve been waiting for it, bored with everything else, and now, here it is. Tobias and Jube prints and goods at redbubble! Tobias and Jube stamps for Line messenger! Old-school Tobias and Jube comics that I’d hoped to have rescanned and recoloured by now, oh well! You want more?? Tell me about it! No, actually tell me about it. Thanks. Thanks for enjoying my work, and thanks in advance for telling your friends and social networks about it! It makes a big difference; you have no idea. tl;dr: Lots of new Tobias and Jube stuff! Here and here. Hooray!